These portable, stackable silicone bowls feature a wide base (no tipping! ), low profile and nifty sidewalls to help your little one scoop up their edibles (fewer spills and uh-oh"s!) Perfect for home use, at daycare or on the road. 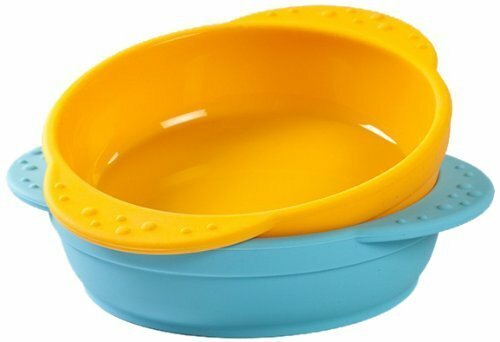 And, little bites bowls are dishwasher-, refrigerator-, freezer and microwave safe. Updated design feature handles for ease of transportation. Like all Kinderville products, Little Bites bowls are a fantastic alternative to plastic and are bacteria resistant and, most importantly, BPA, phthalate, PVC and lead free! Why Silicone for Food Serving and Storage? Silicone is an inert, rubber-like material that is safe, durable and pliable. Silicone, made up of silicon dioxide, or silica, which is a natural element present in organic materials like sand, quartz and rock. Silicon dioxide, and silica is transformed into silicone when combined with oxygen, carbon and hydrogen. Non-toxic Silicone is great for food storage and serving purposes because it is hygienic, hypoallergenic and resistant to bacteria. Silicone is known not to contain any toxic chemicals like those found in plastics (Bisphenol-A, lead and phthalates). And, silicone is known to not react with food or beverages. Silicone is extremely easy to use and to clean. Silicone can be safely boiled to sterilize and is also dishwasher safe, and is sturdy and easy to clean. Certain strong smelling foods have been known to permeate silicone. Please see our page related to detergents & cleaning here. Because silicone can withstand hot and cold temperatures, it is microwave, freezer and dishwasher safe. It is highly portable and very durable, so you can use silicone items time and time again, promoting reuse and less waste.